It’s like a punch in the gut. 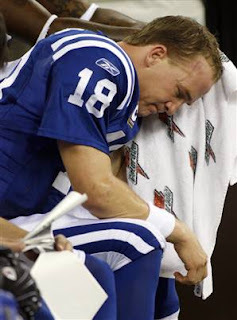 The Saints played a hell of a game and the Colts were about as sloppy as they have been since week one. I’m pretty sure we can blame this on the Colts pulling their starters back in Week 16. Also, destiny. Wait, destiny isn't real so we can’t blame it on destiny. I’ll stop because I just can’t sit here and try to think of jokes anymore.